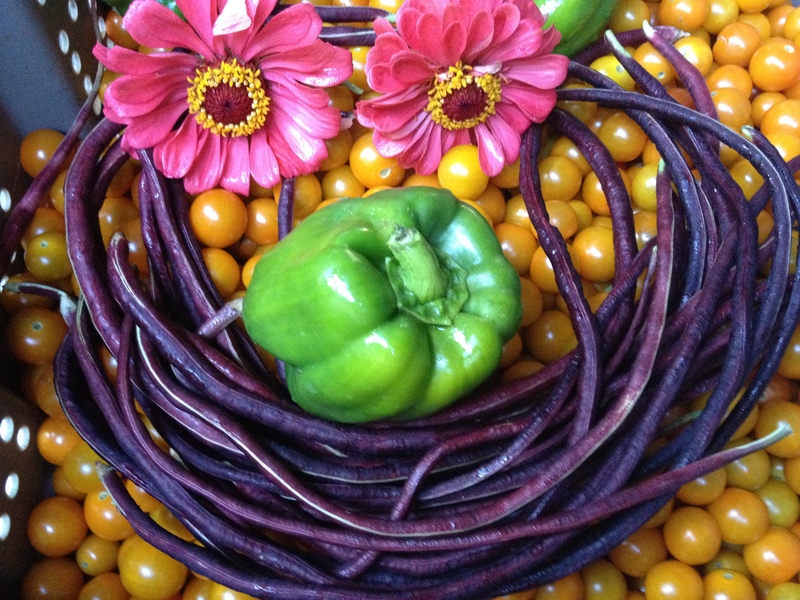 Purple long beans are sweet crunchy stringbeans. They're great marinated and then chopped into a salad! Chef Eric "Dreads" Nielsen from Savant Restaurant sometimes circles the veggie curry plate with a few! Today, 3-5:30pm good people: Microgreens, yard-long purple bodhi stringbeans, sweet mix, spicy mix, baby spicy mix, cherry tomatoes, heirloom tomatoes, slicer tomatoes, cucumbers, sweet green peppers, onions, kale, collards, chinese cabbage, lettuce heads, endive, escarole, italian basil, holy basil, lemon basil, sweet east african basil, garlic chives, cilantro, dill, korean mint, zinnia flowers.